loved ones | Connect. Evolve. Thrive. When I was twenty three, I went on a trip with my family to the Grand Canyon. While I was there I bought a necklace from a Native American woman from the Hopi tribe. 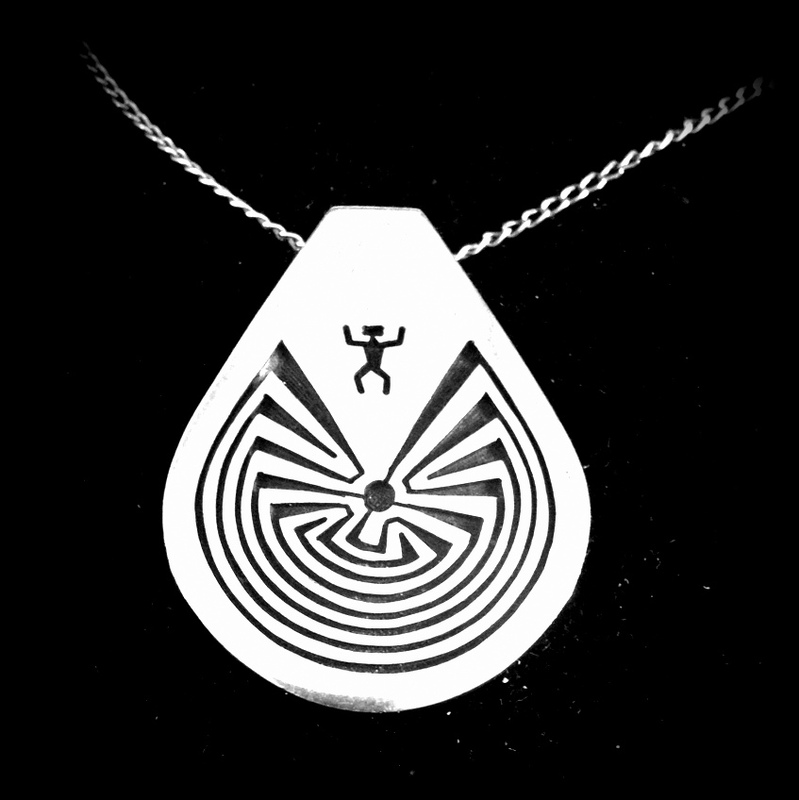 The necklace depicts a man entering a maze. I was told that the maze and the man within it, are a metaphor for life. It is an image and idea that is common to many Native American tribes, each with a slightly different understanding of it. The explanation given to me was that the maze represents life as journey. We spend our lives in the maze, through twists and turns we often feel lost. We want to get out of the maze- to reach the end. What we do not realize is that the end of the maze is actually death. Life is the maze. At twenty three I loved the symbolism. I was embarking on a new journey, entering grad school, and I thought the metaphor of the life as a maze was fitting. At the time I bought the necklace, I think I thought of life as a journey and that I was entering a new phase of my life. Years later, the symbolism is still important to me, but today it means something different. Today, I understand more fully the ways in which life truly is a maze. I am several iterations of my career beyond where I was at twenty-three. I have had two children, one of whom has had significant health issues and learning challenges. I have lost friends to illness and violence, seen friends’ marriages crumble and watched as life challenged those I love. I have also known the extraordinary joy of motherhood, the love and support of a strong marriage, the resilience of my children. I have experienced the excitement of remaking myself and discovering new aspects of who I am. I have witnessed the incredible strength, determination and grace of those who have suffered losses and faced heartbreaking challenges. I have seen love bloom after the devastation of divorce. I have been awed by beauty, great and small, and the diversity of the human experience. Which is to say, I have traveled in the maze- with all of its variation. I love the message of the man in the maze. Too often we spend our lives believing that if we can just get through this one thing, everything will be OK. If we can make it out of the maze, our lives will be wonderful. But for me (at this moment) the symbol means that there is no leaving the maze. If I make it through one part of the maze, if I turn the corner, I will simply arrive in another section of the maze. Perhaps it will have fewer twists and turns, but it is the maze nonetheless. Life is the maze. It is the twists and turns; to borrow a phrase, it is the slings and arrows of outrageous fortune. I will not spend my life waiting to exit the maze, waiting for things to get better. I will fully live and experience the journey, knowing that not all of it will be fun. The maze is a journey, an adventure, a voyage into oneself and the unknown. You cannot escape the maze for a better life. It is your life. You can only choose the path you take and what you learn along the way. I do not know what the symbolism of the maze will mean to me in twenty or thirty years. I only know that the accumulated wisdom of my time in the maze will have affected and altered me. My understanding will have been transformed by further living. I will not hope for an easy path- only the wisdom and courage to grow and evolve in the maze. What my neighbor was decrying was the substitution of commercialism for content- of surface for substance. When advertisers come in to our lives and try and sell back to us our own experiences, they diminish them. Without question Easter eggs and chocolates are part of many families’ memories of the holiday. But they are not, and never have been, the sum total. The holiday has deep religious significance. Not everyone has religious connections to the holiday, but for them, Easter may also be about time with family and perhaps, the joy of Spring- things similarly not captured by commercials. The problem is that when advertisers enter the dialogue, they are seeking to place their products at the center of our experience. Sadly, in our world of constant media bombardment, it is easy to lose what is authentic in our own lives. It is easy to let the televised version of events take the place of our own memories- swapping symbolism and commercialism for real connection. Whether advertisers are painting a picture of the holidays, or love, or fun, or happiness, their aim is always the same- to make us buy things. Their goal is to turn our desire for authentic connection into purchasing. They want to sell us the facsimile and we are all too often willing to buy. But of course, one cannot really buy love or happiness and true religious experiences cannot be purchased at a store. Our culture is all about convincing us that we do not have enough and that the next purchase will somehow make us whole. We are told that “retail therapy” is the way to cure our ills- when really such therapy results in greater credit card debt, more clutter in our homes and the feeling of emptiness that follows the realization that this purchase has not actually changed our situations in any meaningful way. For, like the chocolate bunnies and creams eggs, the purchases are devoid of nutritional value. They offer us nothing that can nurture our souls and our lives. This year, resist the Easter Bunny and instead embrace what is real and meaningful in your lives. Find your spiritual center, embrace a loved one, take a walk in nature. Celebrate what is authentic and true in your lives and you will find it is a better therapy than what advertisers would have you purchase. One of my favorite books is Horton Hatches the Egg by Dr. Suess. It is the story of Horton the Elephant who sits faithfully on a bird’s nest in a tree for fifty-one weeks after he promises the mother that he will babysit the egg. The egg, abandoned by its mother, eventually hatches into an “elephant bird” (read the book- I am not doing it justice!). It is a book about the transformative power of love as well as loyalty and responsibility. It is also a wish. After Horton hatches this amazing creature, the reader is told “and it should be, it should, it should be like that! Because Horton was faithful! He sat and he sat! He meant what he said…And he said what he meant…And they sent him home happy, One hundred per cent!” We all want to believe that our hard work will be rewarded; That all the blood, sweat, and tears that we pour into our careers, our relationships, and our children will pay off and that we will be one hundred percent happy. And perhaps it should be like that. But all too often it isn’t. Even the happiness from a great victory can be short lived. I often imagine that the elephant bird goes back home with Horton and is teased because he is different or that even if not teased by others, he himself feels isolated and alone. I imagine that Horton, the dedicated father he has become, stays up late at night worrying about his child’s future. I imagine that Horton’s happiness does not stay at 100% for very long. What do we do when life does not reward us as we would like or even as we deserve? How do we rise to the next challenge? Part of the answer is actually the first part of Horton Hatches the Egg. Horton shows up. He takes on responsibilities and plugs away even when it is hard. As they say, 90% of success is just showing up. But another part of the answer is sadly absent from Horton’s tale. Horton sits on the egg alone for 51 weeks. He never asks for help. Perhaps Horton fears that others will not be willing. Perhaps he feels that no one else could do it as well as he does. Perhaps he feels that he will not be living up to his word if he takes even a short break to stretch his legs and see his friends. Horton makes the mistake that so many of us make- believing that there is only one right way to do things and that only he is capable of doing it. Sometimes the best way to show up is to know when you need a break. Sometimes it’s about delegating. Sometimes it’s about connecting with others who are dealing with similar issues and learning from them. Sometimes showing up means getting help to view things from a different perspective. Through his love, devotion and dedication to being there, Horton helps to create something beautiful and special. We are all, in our own ways, capable of being Horton. But we shouldn’t have to do it alone. I am long since passed the age when birthdays bring parties and confetti. Nowadays, my cake has enough candles to set off the smoke alarm. Instead, birthdays now offer moments to reflect on my life and my journey. But I still get presents. And like anyone, I enjoy a good present. This year, the best gift I received came in a surprising form. It arrived in the form of a voicemail. I turned on my cell phone and saw a message from an old friend. He and I have been playing telephone tag for several weeks and it was nice to see his name. I pressed play and it began as a normal birthday message. “Happy Birthday, Rachel.” And then he continued “let me tell you what you mean to me.. the cool thing about you is..” He went on to enumerate the ways in which I have influenced and inspired him. I had tears streaming down my face at the end of the message. It was such a beautiful gift. In a poignant one and half minute message, my friend made me feel loved and seen. He gave me the gift of seeing myself through his eyes. And he has some incredible eyes. This is a friend who I admire and respect, who often serves as an inspiration to me. To know that he feels the same is deeply moving. It made me wonder if he how I feel about him. How often do any of us take the time to tell our friends what they mean to us? How often do we thank the people in our lives for the way they shape and inspire us? How often do we acknowledge all the amazing individuals who have helped us become the people that we are today? Research in positive psychology tells us that this giving act not only enhances the lives of those we tell, but enriches our own lives as well. The act of writing a letter of appreciation to someone who has been important to us, increases our own happiness. Gratitude breeds happiness which in turn breeds more happiness and more gratitude. The simple act of reaching out to an old friend, a new friend, a teacher, a mentor, or a family member to tell them what they mean to you has the power to start a spiral of positivity. So sit down at the computer and write an email, or find that piece of stationary and fountain pen or simply pick up the phone. Give someone the gift of your appreciation. Which reminds me, I have a phone call (and a favor) to return.